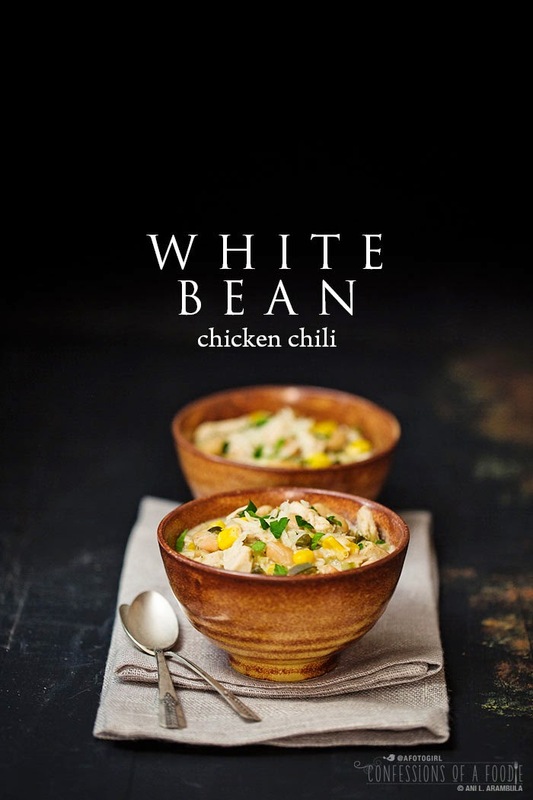 Easy White Bean Chicken Chili with a rich homemade stock forming the base. 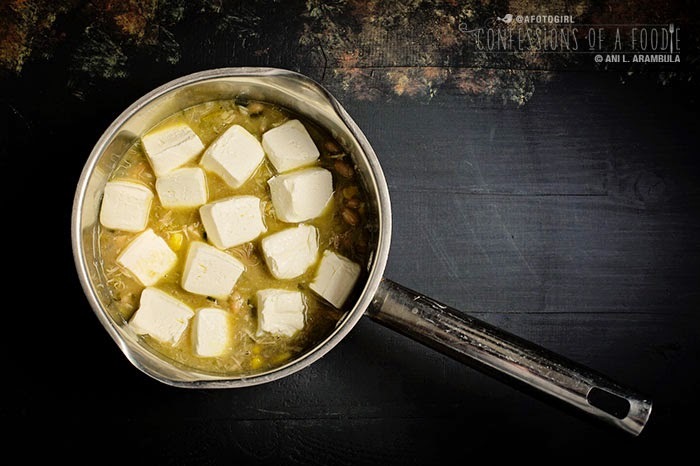 Poblano, corn, diced green chiles and the added warmth from Chinese five spice makes this chili he perfect cold weather comfort food. January has just begun. Hello 2015. You're a new year ripe with possibilities. It's what I love about a brand new calendar: the clean white boxes waiting for new goals to be made and reached, new events to attend that will create new memories. I'm excited for what this year holds for this space, my editorial calendar already filling with lots of ideas for posts and new recipes and stories to share. 2014 was one of the best years to date for this, my happy space on the internet. You made that happen. You've come along for the ride as I slowly turned my eating habits on it's head, changing from carbohydrate rich comfort food to more wholesome and healthier fare. And like any good friend, you've allowed me my occasional indulgence. So if you're reading this, let me take this opportunity to say thank you. Thank you for subscribing to the feed, for commenting on posts, for pinning photos, for cooking and sharing my recipes, for Tweeting, Instagramming, Facebooking. I appreciate it all. I made this chili for a New Year's Day brunch at the home of my friend Stephanie of Recipe Renovator. 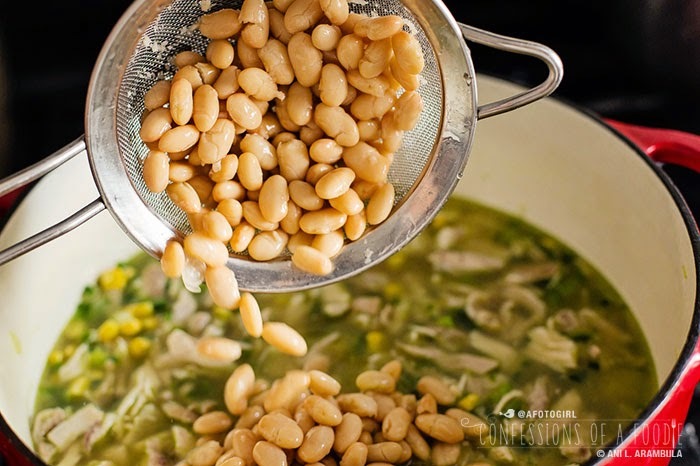 We were in the midsts of a major cold front for Southern California so I knew I wanted to come up with a recipe that would be hearty and warm. 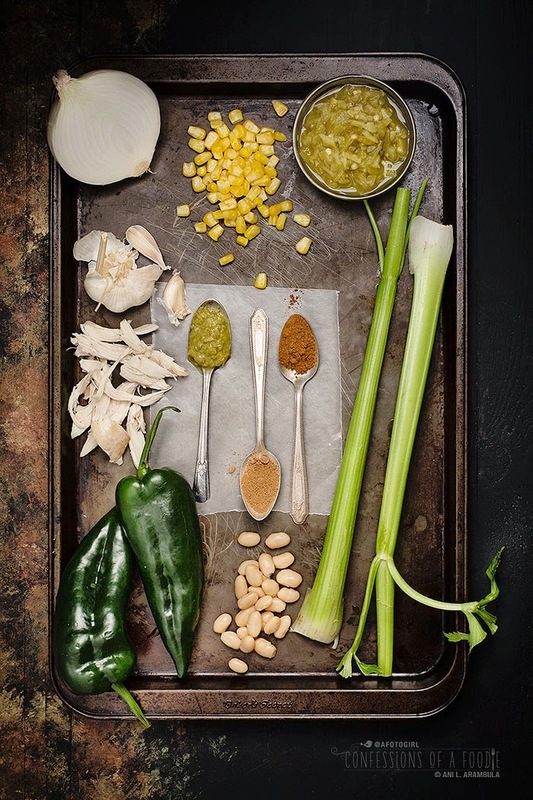 The secret to this chili's success is all in the stock, making this a two day project. 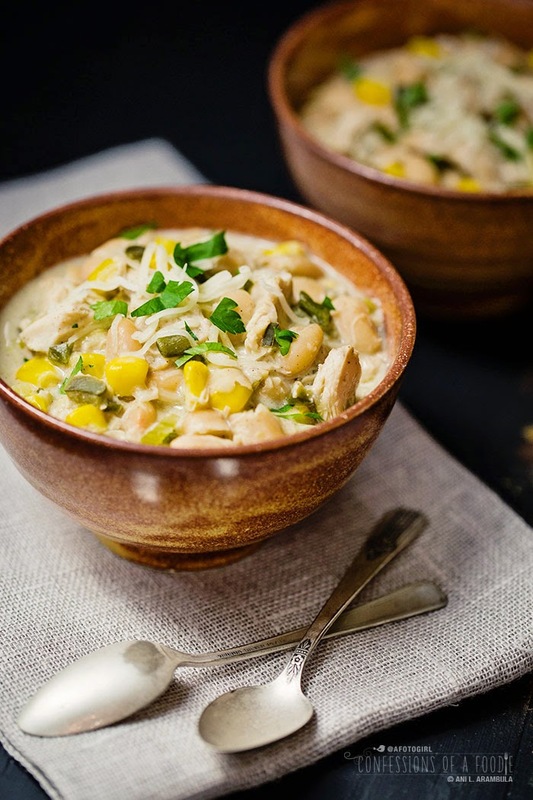 The evening before you want to serve this, throw the veggies, seasonings and chicken into a large Dutch oven or stock pot and simmer for an hour, until the meat is cooked. 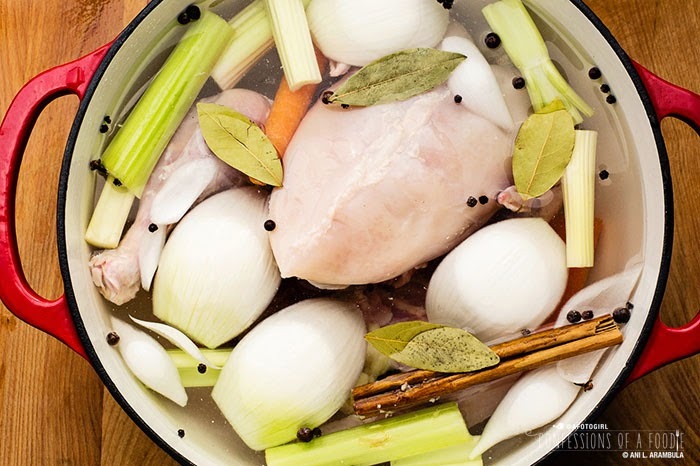 Then you'll remove the chicken from the pot, debone the chicken when it's cool enough to handle, transfer the stock to a slow cooker on low with the chicken bones and let it simmer overnight. 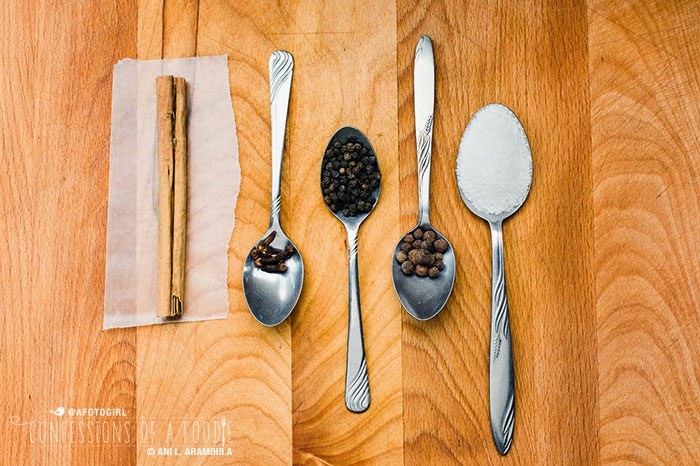 In the morning, you'll wake up to the most glorious smell in the kitchen and you'll have a richly flavored stock. It's worth the effort to make the stock from scratch but if you really don't want to make your own stock, simply replace the water with store bought low sodium chicken broth when you cook the chicken. 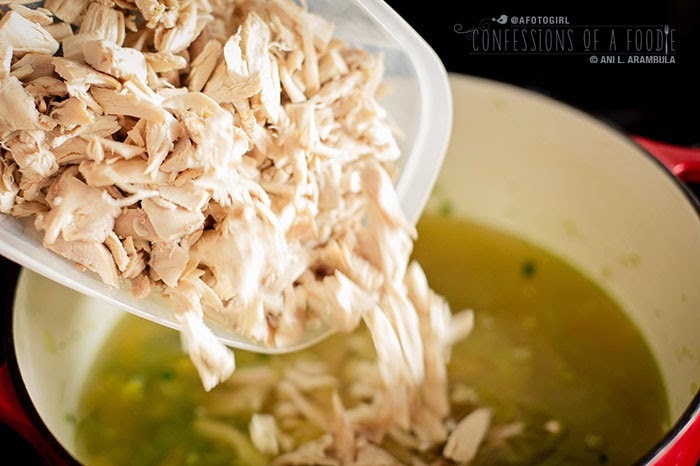 When the chicken is cooked, remove it to a sheet pan or platter to cool then shred, strain the stock, return the stock and the shredded chicken to the pot and proceed with the recipe. 1. 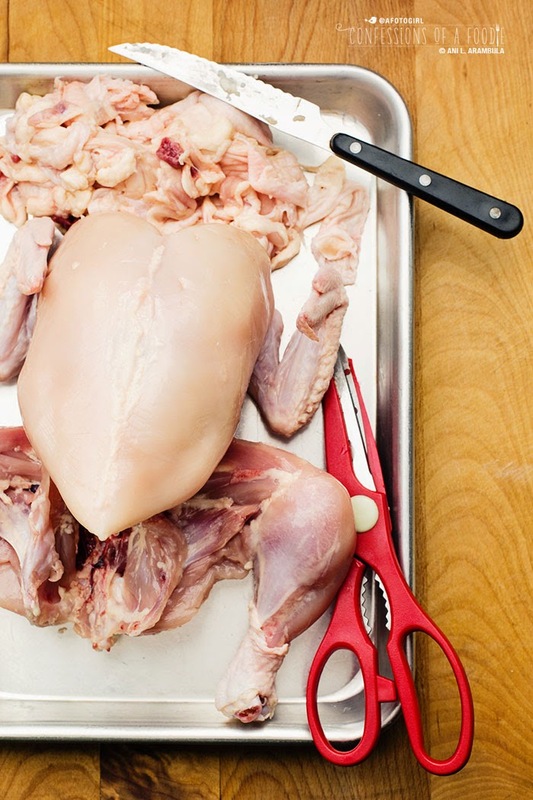 Remove the skin and as much visible fat from the chicken as you can. This step will help to produce a lower fat stock. Place the chicken in 6-quart Dutch oven or stock pot. Add the vegetables to the pot, stuffing a quarter of an onion, one garlic clove and one piece of celery into the chicken's cavity. Fill the dutch oven with water to cover chicken. Add the rest of the stock ingredients except for the vinegar. Bring stock to a boil, reduce to a low simmer, cover and cook for one hour. When chicken is cooked (nearly falling off the bone), remove chicken to a plate and allow to cool enough to handle. In the mean time, transfer the stock, including the vegetables, into a slow cooker. 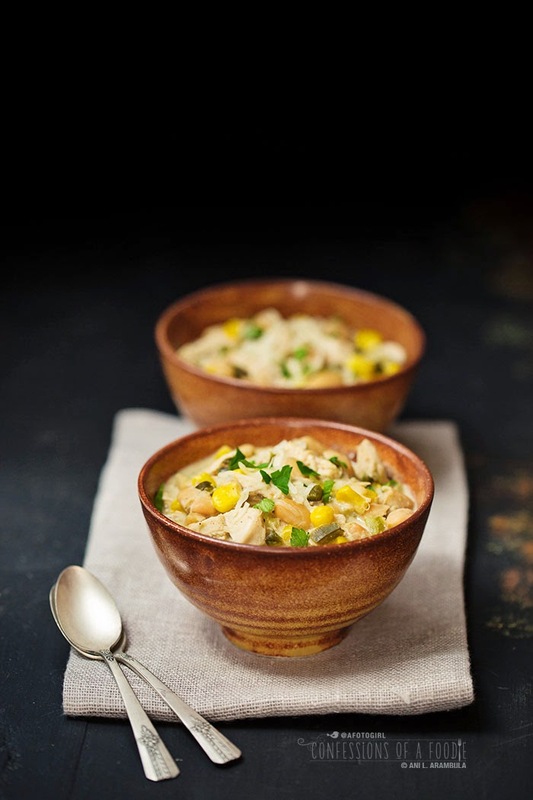 When meat is cool enough to handle, remove all the chicken meat from the bones then add the bones to the slow cooker. Add the cider vinegar to the slow cooker. 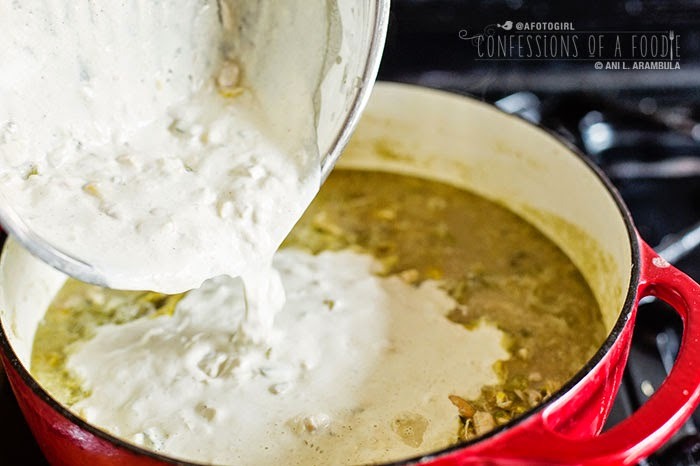 Let simmer on low overnight or at least eight hours (the longer it simmers, the more flavorful the stock). When chicken meat is completely cooled, shred the chicken then transfer to an airtight container and store in the refrigerator until ready to use. 2. When ready to make the chili, place the Dutch oven on medium heat and drizzle in the olive oil. 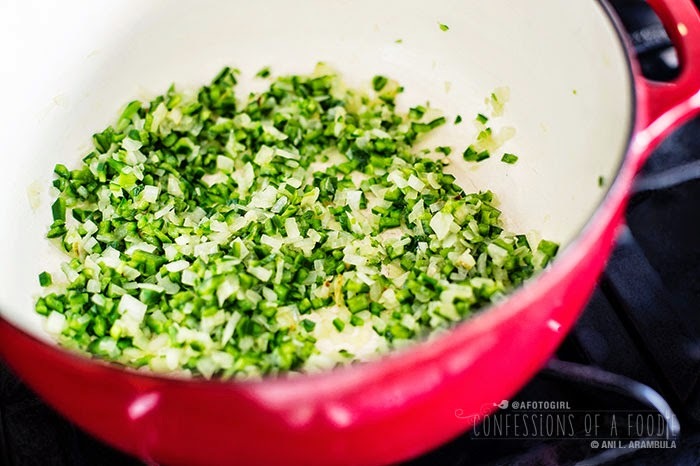 Add the chopped onion and sweat for 2 minutes. 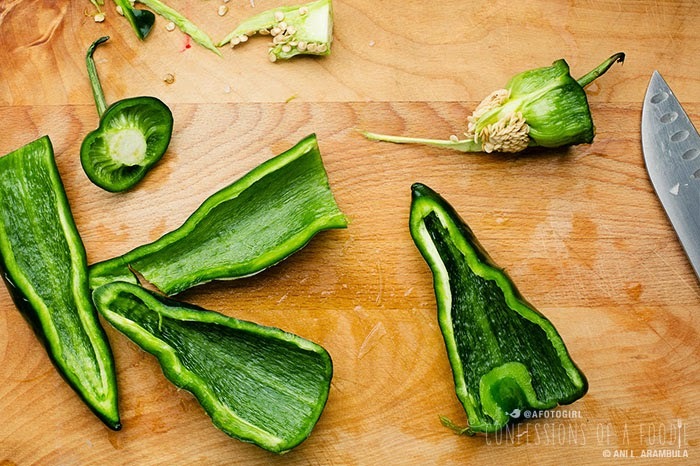 Add the poblano; cook for 2 minutes longer, stirring occasionally. 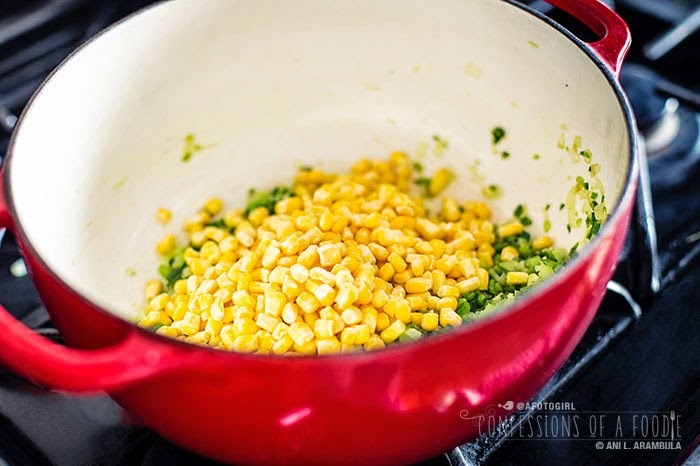 Add the corn and cook for 5 minutes, stirring occasionally. 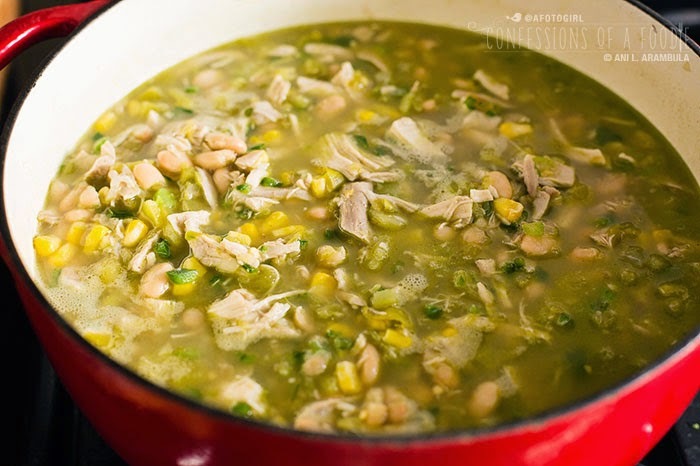 Add 3 cups of the warm chicken stock, then add the shredded chicken, add all but 2 cups of beans, reserving the rest to puree in the next step. Add the diced green chiles, harissa, Chinese five spice and nutmeg. Simmer for 20 minutes. 3. 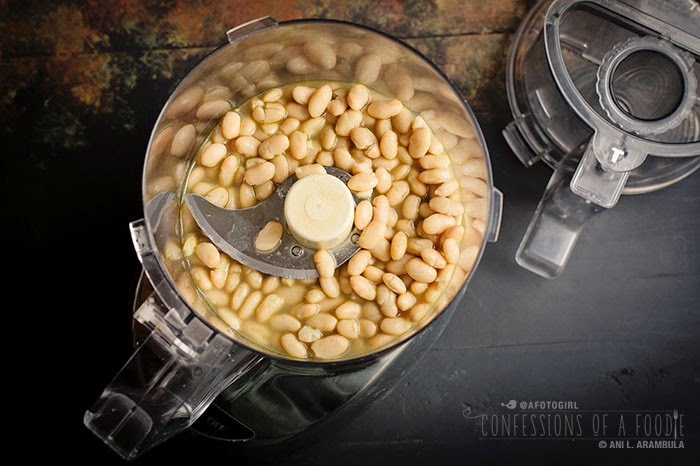 Add the reserved beans to a food processor along with ½ cup of broth. Process until smooth and stir the pureed beans into the chili. 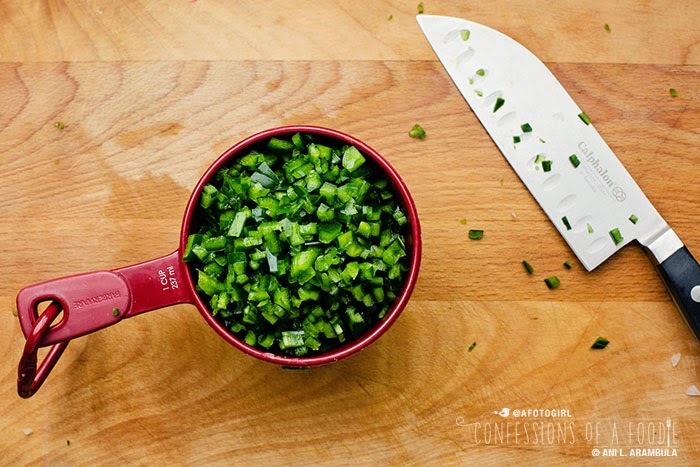 Remove 1½ cups of chili to a small sauce pan and place on medium heat. Add the Neufchâtel, stirring until smooth and incorporated. Pour the cheese mixture into the chili pot and stir well to combine. Season chili with salt to taste. For a more soupy chili, add additional broth. Serve with optional toppings. Heidi, burr... I pull out the scarves when temps get below 65! LOL... Isn't that quote great? When I read it, I knew I had to share it. I posted it to my personal FB wall on New Year's Day and it really touched a lot of folks who copied and pasted it to their walls. I know for me, I focus too much on trying to do something perfectly that I will either not try in the first place or try but discount the lesson learned in failure. Mistakes are ours to make and grow from.